Some of you may have been introduced to this saying via a U2 song called “Trying to Throw Your Arms Around the World.” But it has been traced back to feminist icon Gloria Steinem, who in turn credits an Australian writer, politician and activist named Irina Dunn. Dunn reportedly coined this phrase sometime around 1970. But listen up, men. It’s time to debunk this aphoristic slap in the face. I am here to disprove this clever little maxim. Scientists are learning that climate change (among other problems) is harming the oceans. We believe — at least many of us do — that carbon-dioxide-caused climate change is partly the result too damn many cars. Given: fish live in oceans. Ergo: more bikes would be good for fish. Gentlemen, fish really do need bicycles. In no way do I mean any disrespect to Irina Dunn or Gloria Steinem — or Bono for that matter. All of whom have done far nobler things than I ever will. Nor does this proof suggests that women actually do need men. We merely have shown here today that Dunn’s pithy maxim needs updating. 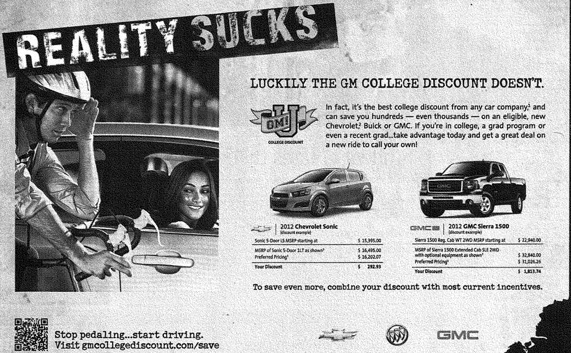 The much criticized GM ad. I know that is terribly not poetic. But just so you know: You can disparage men all you want. We deserve it, I’m sure. But disparaging the bicycle will not stand! Just to let you know Eugene, that for years I have had a little cartoon attached to my computer that shows a beautiful, obviously female, fish peddling away for all she’s worth on a bicycle! What annoys me about bicyclists is that they are so arrogant on the road which they think they have a god-given right to. They do not pay registration fees, nor do they not pay for a bike licence or go through a driving test, which they should if they want respect from car drivers. Wow. An honor to have you stop by and comment, Irina. I will say that the gist of your remark might be, on this blog, a bit like smacking a hornets’ nest with a stick — but I’m guessing that’s not a problem for you. Not in the least. Troll harder. Well, Irina, I think that people are people. Are there arrogant cyclists? Sure. Are people who ride bikes more arrogant as a whole than people who drive or the population in general. I doubt it. Does it annoy me when somebody on a bike disregards a red light or rides the wrong way on a one-way street? Sure. Does it annoy me when a motorist speeds or chats on a cell phone while driving (now illegal in this state)? Definitely. Do cyclists have a god-given right to the road? I don’t think I’m close enough with the Lord to say, but we do — at least here in Oregon — have a legal right to the road. I do own a car, too, and pay fees on it, and gas taxes. On the other hand, bikes do little damage to the roads, compared to cars. I really don’t know about licensing or testing. I do think education is good. I think cyclists benefit from classes that teach about riding safely and responsibly. We have some of those around here, though they are not required. I don’t think it would be a bad idea to require school kids to have such classes. Perhaps they do. I’m actually not sure about that. In short, I don’t agree with your perception, although I think many people share your views. It’s a bit of a problem, especially since the numbers of people cycling to work and so forth seem to be increasing. But I’m confident people can work this out. The driving test I took when I got my driver’s license? I passed that. And I ride my bike almost everywhere. Your point? Irina you are off base on a few of your points, which I think Eugene Bicyclist addressed pretty well. Cyclists do have a right to the road and we do pay the taxes that pay for our unequal, unbalanced, and unhealthy transportation system. If we mainstreamed our transportation infrastructure to add better bike facilities that more people felt more comfortable with then we would have more “mainstream” people (parents, kids, professionals, etc.) and then more mainstream behavior. And yes, we do teach Bicycle Education in our school system in Eugene. Not to every student yet but we’re working towards it. It’s like a Drivers Ed Introduction, you’re just driving your bike. Here’s hoping you get the same respect you give out on our roadways. Personally, I would like to see more bicycles on the road to lessen the impact of our car-driven culture and the effects of emissions on our atmosphere. I would also like to see compulsory registration (with number plates) for those intending to use public roads on their bikes, and also a licensing system so that they have to pass specific tests, both theoretical and practical, designed for bike users. After all, an ordinary car licence does not allow you to drive a truck, does it? I also acknowledge that some car drivers are also pretty arrogant and don’t want to share the roads with cyclists. Unfortunately, there will always be some who are not able to ride a bike — the old, the infirm, women who have to shop for their families. Perhaps the vehicle for them would be a covered variation of the one used by people who have difficulty walking. I’m a guy/dad and I do the shopping for my family. And I do it by bike. But I agree, not everyone can ride. My wife drives for work. We drive for some trips. But the way we build our transportation system now says- everyone should drive all the time. And regarding licences for cyclists- another hot button issue but basically we need to make cycling and walking easier, not more difficult to encourage it’s use. Again, if we built a better system it would be less of an issue than it is now. “Women who have to shop for their families”? As I’m aware of the history, bikes came before roads, which came before cars, which came before vehicle registration (or drivers licenses) – so the idea that bikes on roads require registration (or their operators require a license) is backwardly applying that which was made necessary by cars to bikes. Pedestrians use public rights of way, can violate laws and can place themselves and others in danger – and they’re not even legally required to wear lights in the dark when nobody can see them, much less get a license or registration for their shoes. The bicycle wasn’t invented until the 19th century, Kevin. I believe there were roads before then. And plenty of other vehicles using them. Wait, people weren’t riding mountain bikes before they figured out how to make roads? I need to sit down. wait, chariots weren’t just sideways roman bicycles that tailgate horses? I was thinking of the Good Roads Movement, started in 1880 by the League of American Wheelmen.